athleticnetwork@louisiana.edu (Republished from the Spotlight Feature on Former Athletes in May, 2017). Tony Minnis did plenty of interviews when he played tennis for Louisiana's Ragin' Cajuns from 1985-88. He was a vital fixture in coach Gary Albertine's program, amassing a 91-40 singles record on teams that won 78 matches and made an historic first trip to the NCAA Tournament in 1988. So it wasn't unusual for the Baton Rouge native to answer a question or two along the way. Minnis also had a successful 21-year tenure as LSU's women's coach, a job with frequent interview possibilities. Now, though, he's on the other side of the net, making a name for himself as a sports reporter with features shown on College Tennis Weekly and College Sports Weekly. His work shows promise on the compelling Pray for Luke campaign, the story of New Orleans product and Texas Tech coach Tim Siegel, and the family's ongoing challenge after son Luke suffered severe brain damage. New Orleans Saints quarterback Drew Brees, tennis great Rafael Nadal and members of the Texas Rangers offer encouragement in the feature. Minnis is getting into the rhythm of his new career, but it didn't come overnight. “Was I nervous for the first show? Are you kidding?” Minnis said. “But I've become more confident, more comfortable with that I'm doing. I do the writing and the interviews, and the production company handles the distribution and editing. Each story takes from 2-4 weeks, as needed. “We were at the NCAA men's and women's (tennis) championships last year, but we want to expand to other sports like golf and softball. I really want to go beyond the Power 5 conferences to see the larger view and tell what other places do. We went to Southern New Hampshire, and that really opened my eyes to Division II schools. It's the latest phase for Minnis, who's never been afraid of trying something different. Minnis graduated from UL with a finance degree, and has an MBA, but found the game of tennis more intriguing to follow. “I got into coaching, to put off the real world for a while, and it just kind of evolved,” Minnis said. “I enjoyed seeing kids develop. You have to form trust in the relationship with your players. I looked at each of them as individuals. At LSU, Minnis put together a 285-234 record competing in the grueling Southeastern Conference. In that highly-competitive league, it would not be unheard of to be No. 3 in the SEC but ranked No. 1 nationally, or to boast three of the nation's top 5 programs. Despite that challenge, Minnis was named Southwest Region Coach of the Year five times, Louisiana Coach of the Year three times and SEC Coach of the Year in 1997. Once he got rolling, 15 of his last 18 teams reached the NCAA Tournament. “It took a couple of years to get it going,” Minnis said. “They had had 4 or 5 coaches in 12 or 13 years before me. We needed some stability. My fifth year, we had a tremendous season. 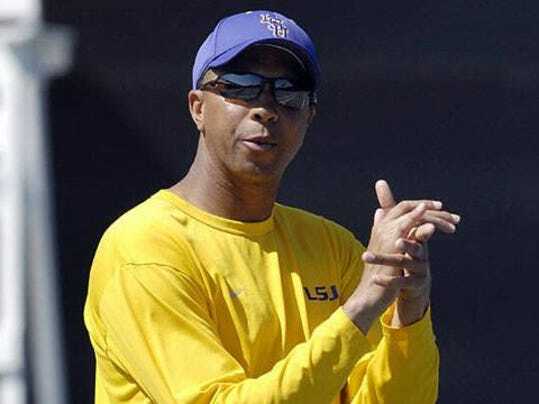 At LSU, Minnis was surrounded by a wealth of coaching veterans in other sports – Dale Brown, basketball; Skip Bertman, baseball; Jerry Simmons, men's tennis; Pat Henry, track and field; Sue Gunter, women's basketball; D-D Breaux, gymnastics – and took advantage. “I made it a point to talk to them, and they were all extremely accommodating,” said Minnis, who lobbied for the tennis program to get an indoor facility to keep pace with other SEC powers. But he found an unwilling ally once Joe Alleva became athletic director. Minnis received a $3,500 salary bonus for reaching the NCAA Tournament in 2012, then was promptly fired by Alleva for not meeting competitive standards and replaced with Julie Sell. Minnis sued the university, but the case was dismissed. The school now has an indoor facility, as Minnis requested. He had a top salary of $85,000 at LSU. Sell is paid $110,000. Undaunted, Minnis has moved on successfully, responding to challenges as he did as a young player. He started playing tennis at age 8, at City Park courts in Baton Rouge, schooled by his father Howard, who was coach at Southern U. Timing was perfect, as Albertine had collected No. 1-ranked Southern juniors like Bret Garnett, Ashley Rhoney and Jay Bailey. It was a challenging, energizing scene. Albertine lit a fire under those Cajuns, and coupled with a rigorous fitness regimen by strength coach Brad Roll, they were ready to succeed. “There's no substitute for attitude,” Minnis said. “You have to expect to be successful, and Gary instilled that confidence every day. We had a chip on our shoulder, in a positive way, going against the SEC, Big 12 and ACC. Minnis developed his serve-and-volley game well enough to go 26-7, 23-11, 19-9 and 23-13 for the Cajuns, mostly at the No. 5 spot in the lineup. USL finished 21-12, 21-9, 19-9 and 17-9 during that time, reaching the NCAA and earning a No. 15 final rank in 1988. “We defeated UCLA and Ga. Tech, and that really helped,” Minnis said. “We felt pretty confident. It was a great feeling because we stuck with the process and reached our goal. Now, on the other side of the net, Tony Minnis is searching for similar stories of confidence, success and drama. This story is part of an ongoing series at www.athleticnetwork.net, a website dedicated to preserving the history and traditions of almost 120 years of athletics at the University of Louisiana.